At Palmetto TatDays this year, a few of us talked about favorite patterns from past years. I think Erin Holloway Moseley's patterns always have a lot of personality. When I got home, I pulled out my pattern CD's and found the instructions for these two. And here is Doodle the Poodle from 2010, I think. I've admired this one for a long time. I wasn't paying attention and used beads a little too big, so the feet and tail are a bit lumpy. I would recommend this one for experienced tatters only. 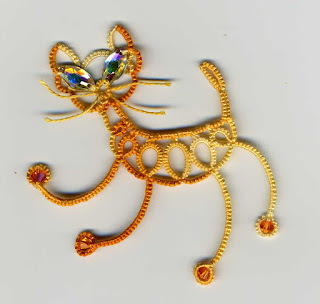 And do use a bead spinner. 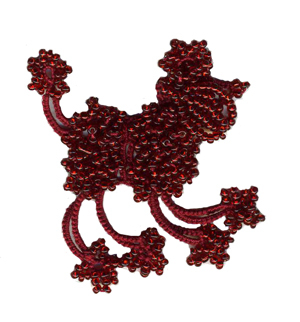 You need a bazillion beads, but they are all on the ball thread. In the CD and video section, if you click on the year, you can see the projects on that CD. This year's CD has just come available. I know some of you have been waiting for it. 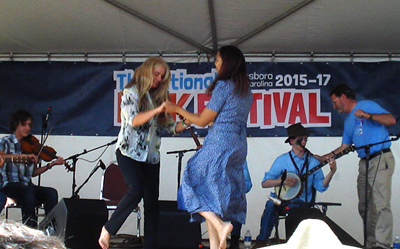 It's already been a month since the National Folk Festival was held here in Greensboro. I was only able to attend on the last day, but had a splendid time. 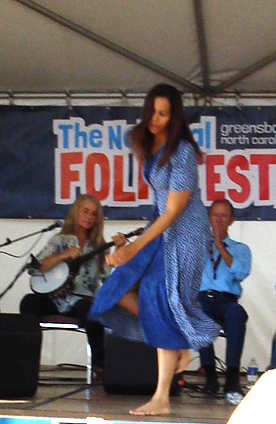 I got to see one of my favorite performers, Rhiannon Giddens. I've been a fan since she was in a local Celtic band and now she's a famous Grammy winner. 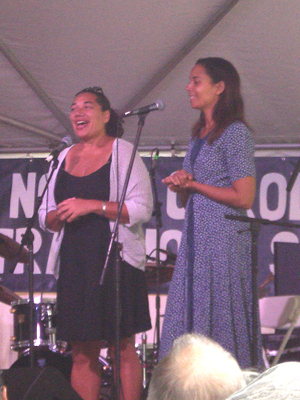 Here she is with her sister, singing wonderful harmonies. The audience was often invited to sing along. Can I now say I have sung in concert with her? Though it's a good thing she had a microphone and I didn't. 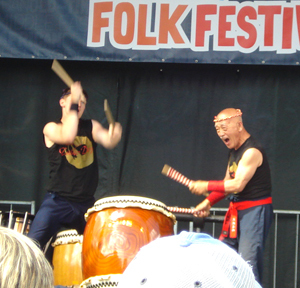 These are members of the San Francisco Taiko Dojo with Grand Master Seiichi Tanaka. This was a great, energetic performance that earned an enthusiastic standing ovation. 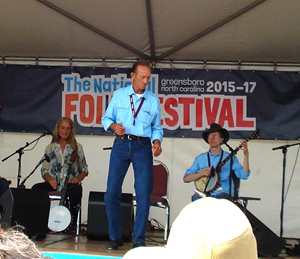 Then a stage with a group of Piedmont and Blue Ridge artists. 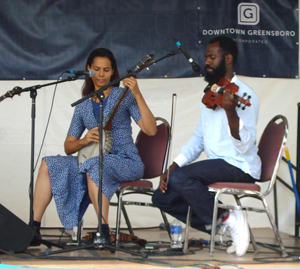 Rhiannon again with fellow Carolina Chocolate member Justin Robinson. Thomas Maupin, a buck dancer, who spoke about music and dance in a very touching way. 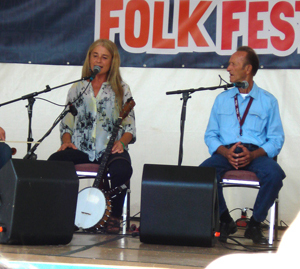 Sheila Kay Adams, who tells stories and sings acapella Appalachian ballads. Wayne Henderson, who makes and plays guitars. They would take turns performing or talking and one of them mentioned how string band music was originally dance music, so they all took turns dancing as the others played. I finished knitting this a long time ago, but only last week finished blocking and sewing in ends. 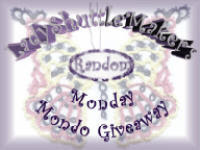 This is the Freya Shawl designed by Renate Haeckler, a free pattern on Ravelry HERE. The pattern is for a 3/4 circle shaped shawl, but I did fewer repeats to make a half circle so my yarn would last for more rows. I knitted until I ran out of yarn, but I don't remember how many rows short of completing the pattern I was. 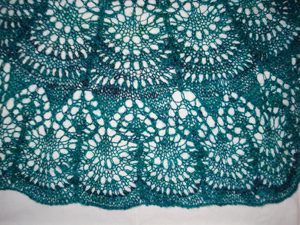 It came out a good size though, about 28 inches deep after blocking to a lacy effect. The yarn was hand spun by me on a drop spindle using some slightly variegated Romney roving, about 9 ounces.